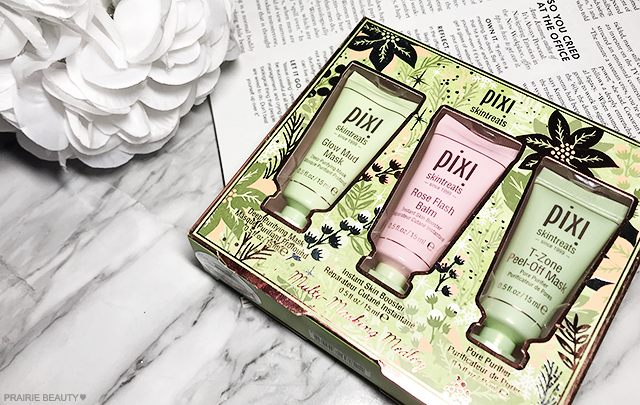 I've had really, really good luck with Pixi Skintreats products in the past - the Pixi x Caroline Hirons Double Cleanse continues to be a favorite in my collection - and I've been wanting to try more for ages but just hadn't gotten around to it until this holiday season brought some sets to my local Shoppers Drug Mart. 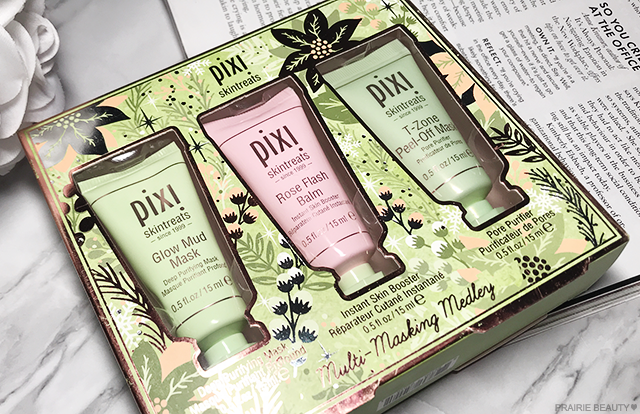 I'd been hearing a ton recently about the Pixi Rose Flash Balm, so when I saw the Pixi Skintreats Multi-Masking Medley contained that product along with two others, I was sold and I picked it up to try out. Keep reading to see how these products worked out for me! 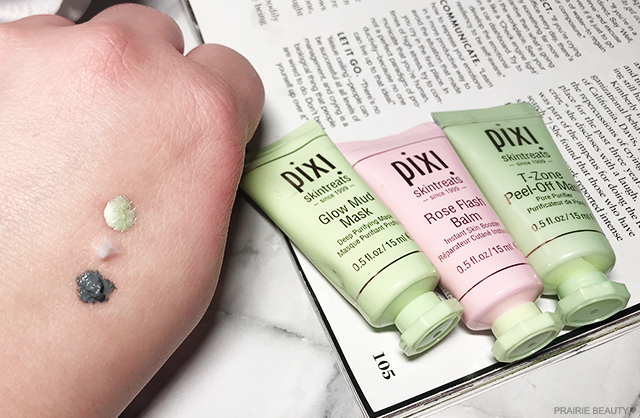 Discover our 3 treatment masks to brighten, re-hydrate & minimize pores. 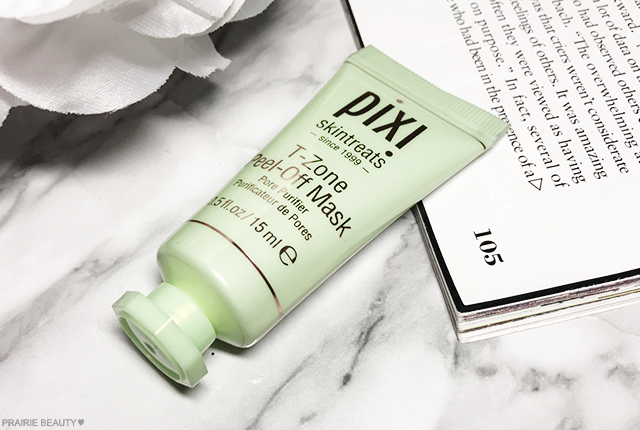 • T-Zone Peel Off Mask is a detoxifying peel-off mask draws out impurities and lifts away oil to reveal immediate results. One thing that I really love about this set is how truly different each of these three masks is in both what it does and how you use it. I felt like it gave me a good chance to try out three very different products from the brand and see what really worked for my personal skin care needs - and I have to say, I was a little bit surprised by the results! I really, really love a mud mask, so I was really excited to try this. The first time I applied it, I was really surprised at how little product I needed to use to get full coverage over my face. It smooths onto the skin really easily (I use a flat foundation brush to apply all of my masks) and applies to a really even thickness over the skin without any gloopiness. Upon application and while I wear it, there's a slight tingly cooling feeling on the skin, but it isn't one that is at all unpleasant. The last time I applied this (last night), I found myself really paying attention to the scent, which I likened to a hippie's house in this very best way. I'm terrible at describing scents, but I will say it's a really lovely one and as I lay in the bathtub with this on my face it gave me a very serene, spa like feeling. When it comes to ingredients, I feel like this is formulated really brilliantly with both purifying and hydrating ingredients that really work. 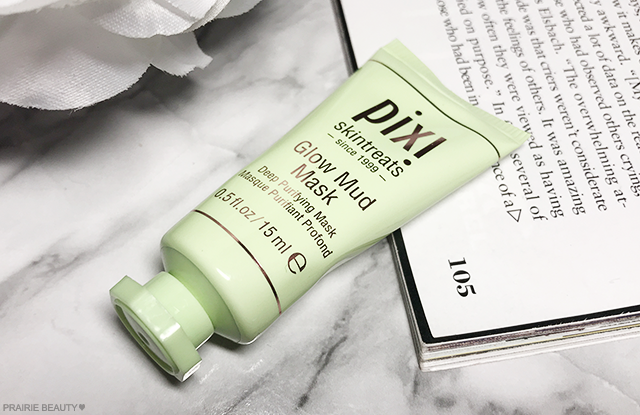 Dead Sea Mud and Kaolin make this mask one of those ones that is delightfully gross in the way that you can literally see it pulling gunk out of your pores as it dries, while Aloe Vera, Glycerin, Squalane and Jojoba Oil work at balancing and hydrating the skin. When I rinse this off, my skin feels really clean and fresh without feeling stripped or dried out like some other masks. In the past, I've had to apply a facial oil before applying a mud or clay mask, but with this one that step is entirely unnecessary. I'm kind of in love with this mask and have every intention of picking up a full size as soon as I work through some of the other similar masks in my collection. I feel like this could be a PMS skin savior - and that's really when I need a mud mask to help my skin look and feel its best. This is definitely the product that I was most excited to try since I've seen so many other people in the beauty community that I trust raving about it as a primer step before make up. This is a 3-in-1 product that can be used as a primer, moisturizer or mask for an instant skin boost. In the past, I've tended not to pick up rose scented products because I don't tend to be a fan, but the light rose scent of this doesn't feel like an old lady type of rose and I find a really actually quite enjoy it. The texture of this balm is quite rich, but it does sink into the skin quickly and doesn't feel heavy. At this time of year, when the cold has really hit, the house is dry, and my skin is not at its happiest, I need all of the boost that I can get. Admittedly, I didn't try this out as a mask (mostly because this is a small bottle and I wanted to hoard it) but I have used it both as a moisturizer during my night time routine as well as a primer before makeup. As a moisturizer, I think it's nice but doesn't quite pack the level of hydration that I personally need at this time of year. It would likely be a great option for someone with a more combination to oily skin type. Where this shines for me is definitely as a primer under more matte finish foundations, which at this time of year I tend to avoid like the plague because they tend to really make my skin look like the desert. When applied over this, pressing the foundation in with a sponge so that I don't disrupt the primer and get patchy, this really helps those matte foundations to apply smoothly and keeps my skin looking a little bit more plump and healthy. I have to say, this isn't the hero product for me that it is for a lot of other people, but I do think it's really lovely and would definitely consider picking up a full size in the future. I'm going to say straight off the bat that peel off masks are not really my thing. Every couple of years I go back and try one, remembering when I was a kid and loved the idea of using a peel off mask like a very fancy lady, and it never really works out for me. I wanted to put that out there, because I feel like it definitely informs my feelings about this mask. One thing I've learned while testing out this mask is that you definitely have to follow the instructions and apply a fairly thick layer to the skin for this to have a good peel. The first time I used this mask, I applied it quite thinly and the peel was a little bit infuriating. After that, though, I went in with a heavier hand and it worked out much better. Initially, this mask did feel a little bit tingly, but not uncomfortable, and as it dried down the tingle went away and I didn't notice much scent coming from the mask. As it dries, it does get fairly tight on the skin, but I didn't find it uncomfortable at all. Like I said, you definitely need a thicker layer to get a good peel from this and I found that when I did, it peeled really easily in a large pieces and without any discomfort. What makes me actually want to keep using this mask is how much skin felt afterward - I can't remember a time when a mask left my skin feeling so soft and looking so smooth. It was actually kind of amazing. Like I said, I'm not a peel-off mask kind of person generally, so I don't know if this is the norm, but what this did for my skin was absolutely incredible. I'm really, really glad that I decided to pick up this set. I feel like I would have really missed out on a couple of amazing masking options if I had just picked up the Rose Flash Balm, and that would have been a shame because the masks are actually my favorite part of this set. Admittedly, I know myself well enough to know that I'm personally unlikely to reach for a peel-off mask very often, so it's unlikely that I'll buy a full size of the T-Zone Peel-Off Mask, but I absolutely see myself buying a full size Glow Mud Mask sooner than later because it's just that good. 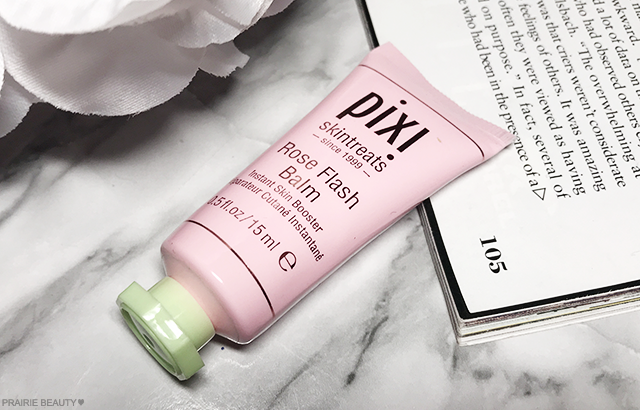 For me, the Rose Flash Balm is a good, solid product, but not one that I'll personally be raving about and recommending to everyone I know. It's good, it really is, but I feel like my expectations might have been a little too high for this to shine. 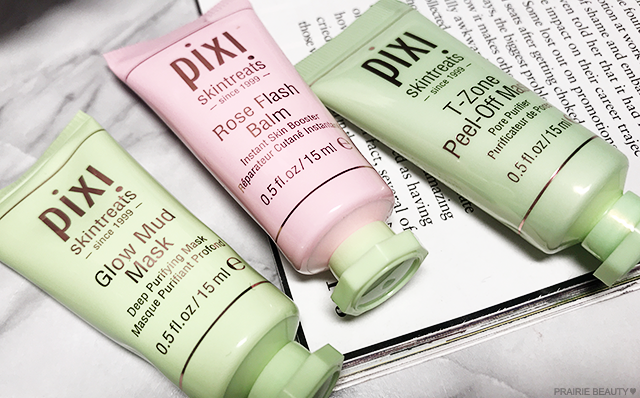 If you're interested in trying out Pixi Skintreats, I'd recommend the Rose Flash Balm if you're looking for a hydrating primer option, the Glow Mud Mask if you deal with clogged pores and breakouts, and the T-Zone Peel Off Mask if you want to smooth and brighten the skin and you're into that sort of thing. Overall, Pixi is continuing to impress me with everything I've tried so far. 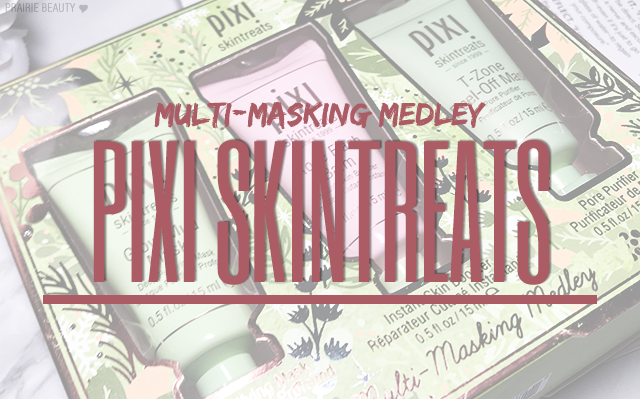 Pixi products are available in Canada at Shoppers Drug Mart! Though you might be able to find this set lingering around there, it was a holiday release so you might have to go for the full size of these products if they interest you.